Our figs are drying on cane mats in the sun on our terrace. Fig and Olive Tapenade pairs brilliantly with goat cheese on a cheese plate (Photo credit: http://www.thewanderingeater.com). 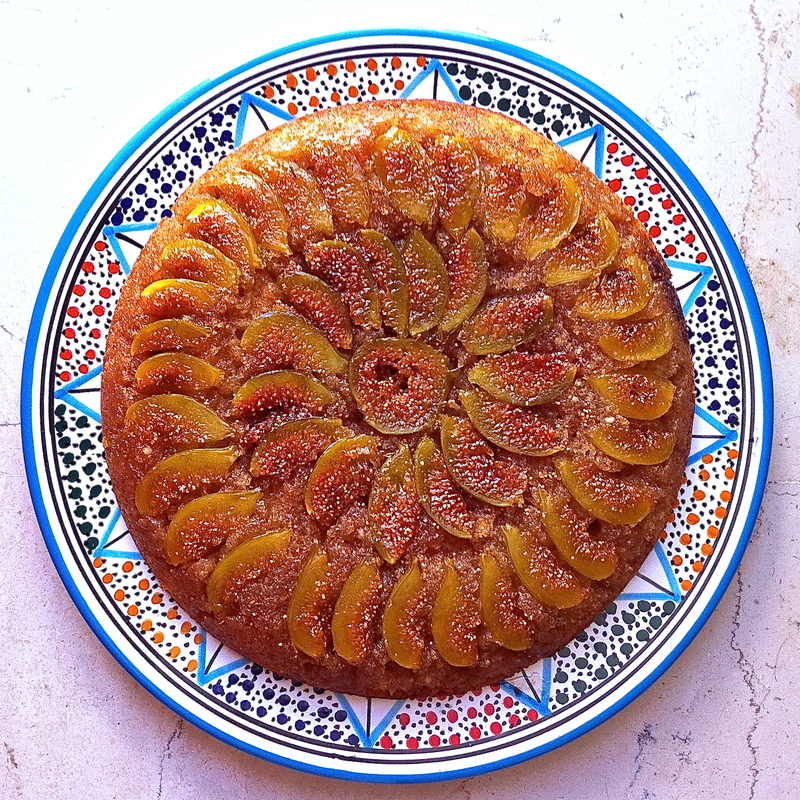 Beyond the recipes I shared a few posts ago in Fichissimo, I am forging new territory—at least for me—by incorporating figs into a kind of figgy-olivey paste. Moved by our plight, two Portland friends, Irene Stevens (Spring Pilates Studio) and Jim Dixon (Real Good Food) shared recipes for fig tapenade, and just in time, too. One is from Saveur; the other is David Lebovitz’s. Although there are a few variations, both recipes are champions because they move figs out of the jammy, sweet camp and into the agro dolce (sweet and sour) sphere, opening up worlds of possibility. Fig tapenade is absolutely gorgeous on a cheese plate or with a soft-ripened goat cheese and good bread at aperitivo time. And you’ll need to have something to do with all those dried figs you’re going to make (keep reading). This cake is a crowd pleaser that couldn’t be easier to execute and its not limited to figs. I’ve also re-purposed a cake recipe that is in fairly regular fall-winter rotation at our house, particularly when we’re bringing dessert somewhere. It’s Deborah Madison’s Pear Almond Upside Down Cake, but almost any fruit will do and you will look incredibly accomplished when you unveil it for guests. 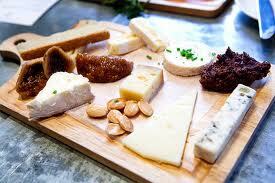 It also uses a fair amount of fruit, which is especially useful during our current bountiful state. Our figs are drying on our roof terrace. Lots more where these came from. We’re also resurrecting a centuries-old tradition used here and sun-drying our figs on cane mats spread out up on our roof terrace. More than a few of our fig benefactors carefully instructed us on the process, but here are some visuals to help guide your way. First wash the figs with care and slice them from the stem end down almost to the base. Then spread them open so that the cut sides are both exposed to the sun. Place them on cane mats (or any surface that allows air to circulate above and below the figs). If you’re worried about insects, cover the figs with a net. Leave them to dry in the sun, bringing the whole cane mat inside each night—or if it looks like rain. 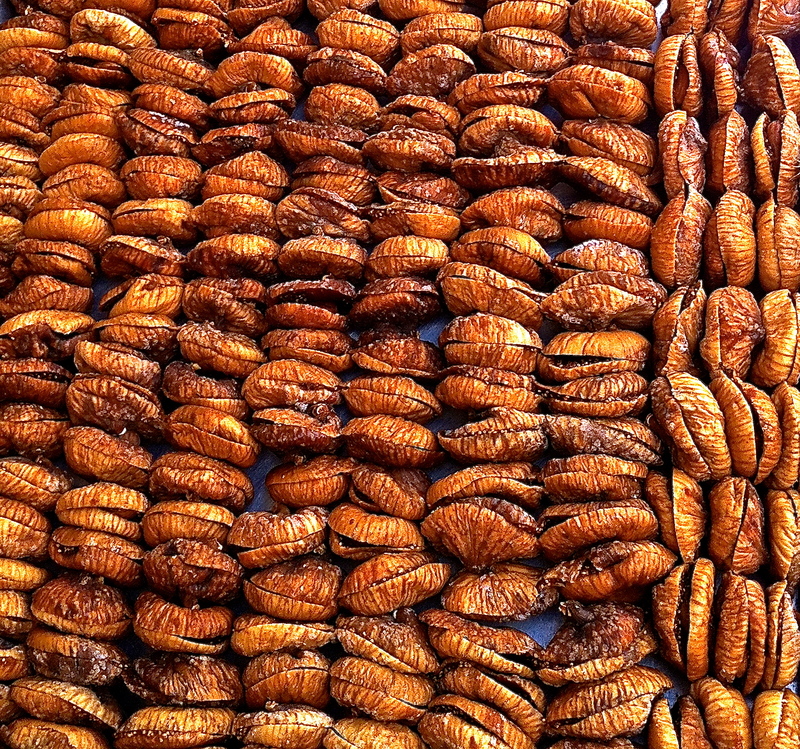 Rows and rows of dried figs are stuffed with a roasted almond, a strip of lemon zest and a small sprig of wild fennel. After anywhere from three to six days depending upon the strength of the sun, the figs should feel dry, without a hint of moisture in their flesh. Place a whole, toasted almond in the middle of each split fig. You might also want to add a piece of lemon zest and a spring of wild fennel if you have it, which is traditional here. 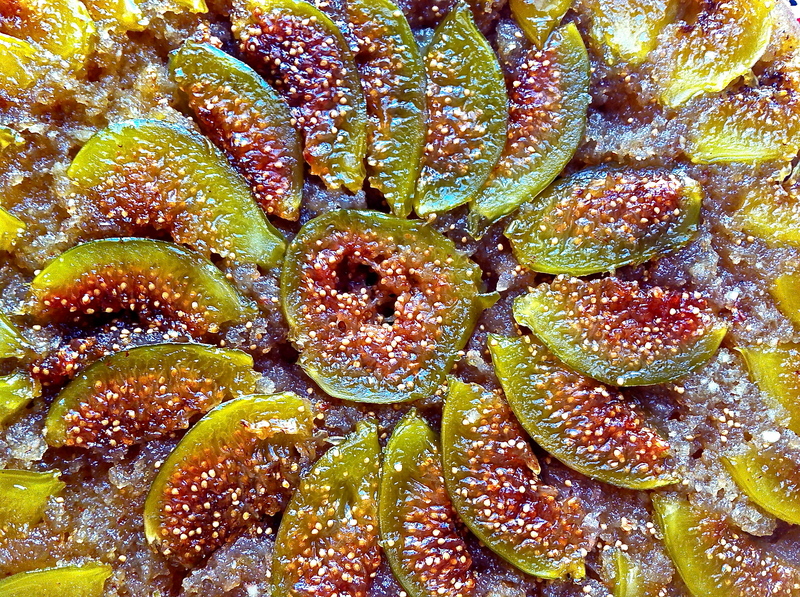 Close the figs up so that they look like a whole fig again and place them in a 350-degree oven for about 15 minutes. They’re finished when they are beautifully golden brown. Store them in sealed container in a cool, dark place. 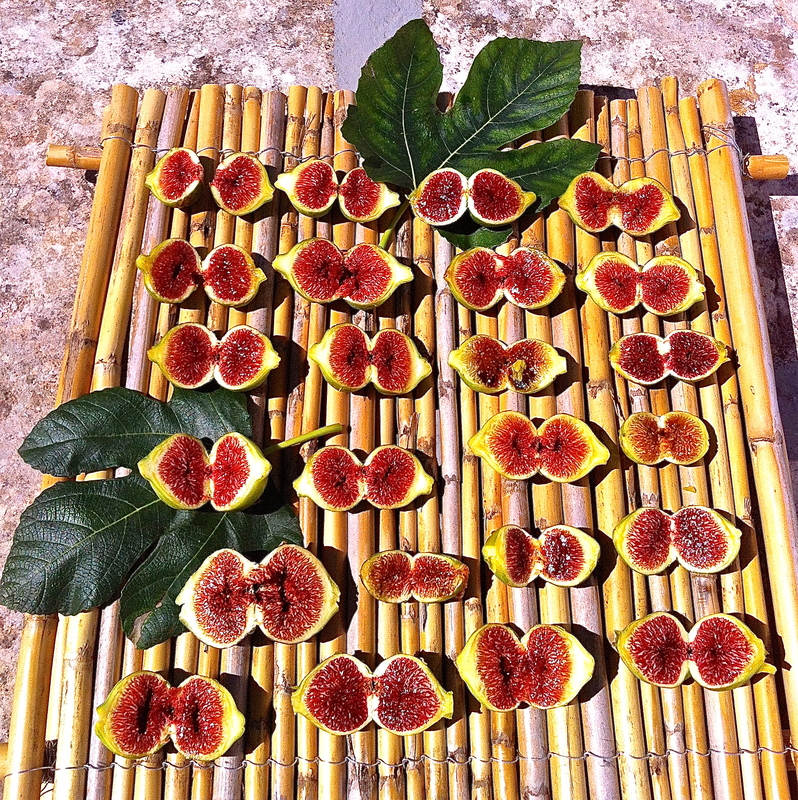 In Puglia, dried figs were kept all winter in terracotta pots, each layer of figs separated by a layer of aromatic bay leaves. And if you want you take things even further, you might consider dipping cooled, dried figs in dark chocolate—a perfect combination of deep caramel chewiness with the musky vinous quality of dark, dark chocolate. Recommended. 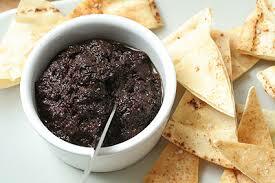 And there’s always the fig tapenade, too. If you’re in a figgy mood and you’ve got your own bounty to put to good use, here are the aforementioned recipes. Go wild. This recipe was originally published using dried figs that are reconstituted by simmering them in hot water until tender. Since I have such a ridiculous quantity of fresh figs, I used them in this recipe instead of turning to the dried variety. Delicious. If you make this recipe with dried figs, simmer ½ cup dried Black Mission figs in a cup of water for 10 to 20 minutes until they are very tender. Drain them and proceed with the rest of recipe. The ingredients for David Lebovitz’s Fig and Olive Tapenade are ground to a smooth, but still slightly chunky consistency in the food processor. So easy to put together, but unusual for a cheese plate or with an aperitivo, this tapenade is a great way to marry figs and olives (Photo credit: http://www.davidlebovitz.com). 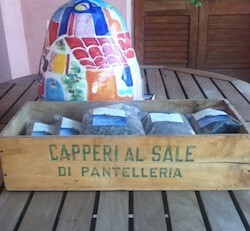 If using a mortar and pestle, mash the olives with the garlic, capers, anchovies, mustard and rosemary or thyme. You can chop the olives first, which makes for less pounding with the pestle—up to you. Pound in the figs. Once they are broken up, stir in the lemon juice and the olive oil. Season with salt and pepper to taste. If using a food processor, pulse the olives, figs, capers, anchovies, mustard, rosemary or thyme and lemon juice to create a thick paste. Pulse in the olive oil until you have achieved a chunky-smooth paste. 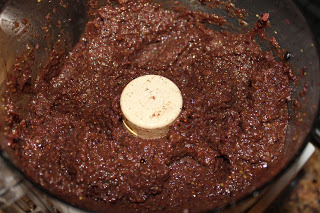 Don’t overdo it; good tapenade should be slightly rough. Season with salt and pepper, if necessary. Use capers from Pantelleria off the southern coast of Sicily when you make these tapenades (Photo credit: http://www.gadling.com). Combine all ingredients in a food processor and pulse until evenly chopped and combined. You can also do this with a good chef’s knife if you don’t have a food processor; a somewhat chunky texture is much more desirable than a smooth, homogenous one. Transfer to a serving bowl, cover with plastic wrap and store in the refrigerator for up to a week (I have kept this MUCH longer with no apparent ill effects). Bring to room temperature to serve. Once the finished cake is inverted, you’ll see each beautiful fig quarter arranged in a spiral pattern in the bottom of the skillet. Green figs are ideal for this recipe, although you can use pears, plums, apricots or nectarines—whatever you have on hand. Just slice denser fruits thin and softer fruits thick and you’ll be fine. This recipe, though seemingly daunting, is incredibly easy to make and universally popular. Serve the cake with softly whipped cream or a scoop of rich vanilla or honey gelato. 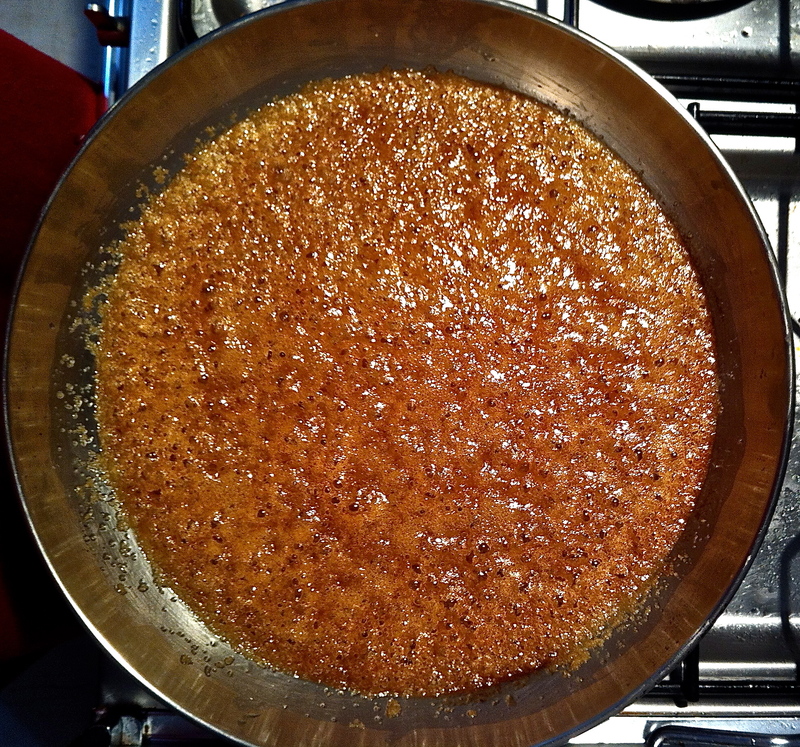 Melt the butter and brown sugar until they combine to cover the bottom of the skillet. Preheat the oven to 375 degrees Fahrenheit. Heat the butter with the brown sugar in a 10-inch cast iron skillet or another heavy bottomed pan of the same size until the sugar is melted and smooth, then remove the pan from the heat. Cut the figs into quarters from the stem (long end), leaving one fig cut in half only. Starting with the outside, set the fig quarters, cut side down, in the pan, angling them so that they nestle nicely into one another. Once you have completed the first circle, make another circle inside the first one. You should have just enough room to place a fig half in the center. Set aside and make the cake batter. For the cake, cream the butter and sugar until light and fluffy, then add the vanilla and almond extract. Beat in the eggs one at a time until smooth. Stir in the ground almonds, followed by the remaining dry ingredients. Spoon the batter over the fruit and smooth it out carefully with an offset spatula. Spread the batter carefully over the top of the figs arranged in the caramel using an offset spatula. Bake the care in the center of the oven until it is golden and springy when pressed with a fingertip, about 35 to 40 minutes. 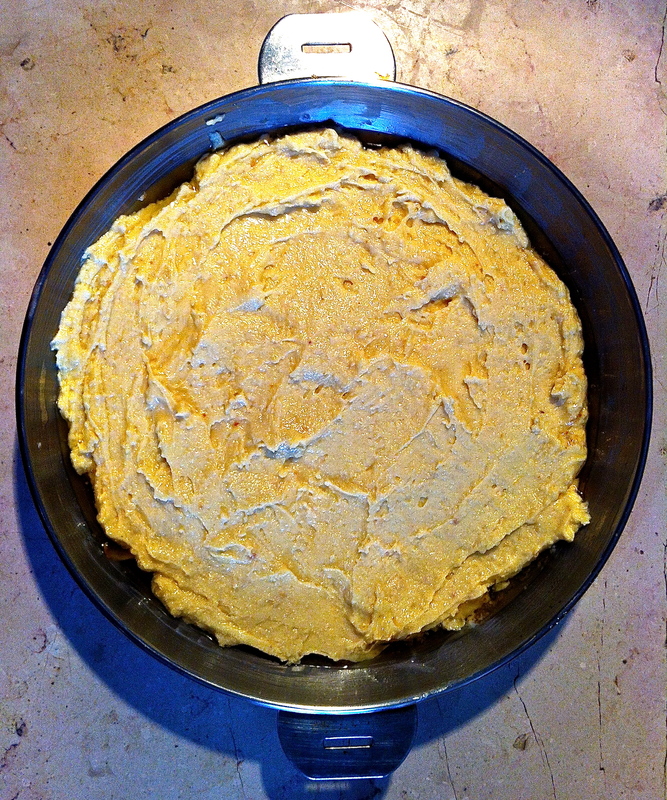 Let cool in the pan for a few minutes, loosen the sides of the cake from the edges of the pan. Set a cake plate on top of the pan, grasp both sides of the plate and the pan tightly and turn it over. Carefully ease the pan off the cake. If any pieces of fruit have stuck to the bottom of the pan, simply pry them off and return them to the cake. I LOVE this! 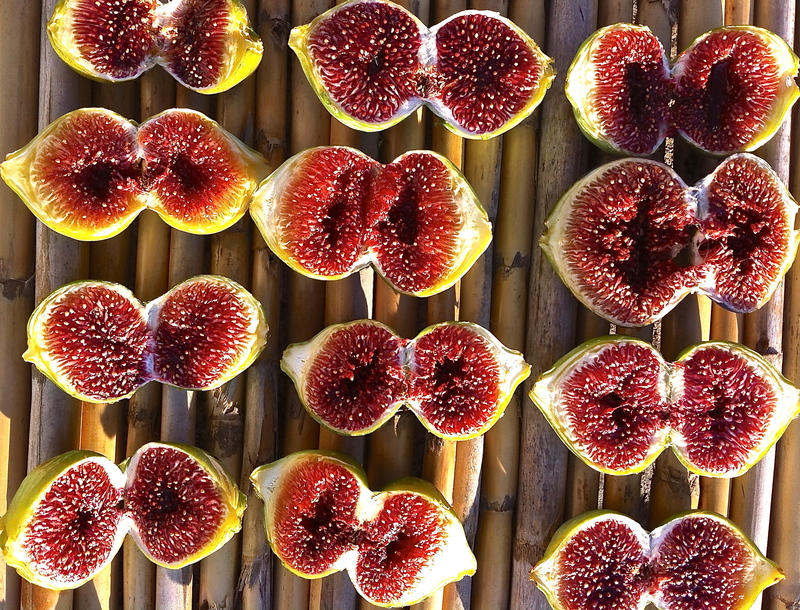 Your fig preparations and the photos are beautiful. May I reblog at The Italian South? So glad you liked this post. Of course you can reblog it on The Italian South! I’d be honored. Hopw you’re well and that your trip was wonderful.